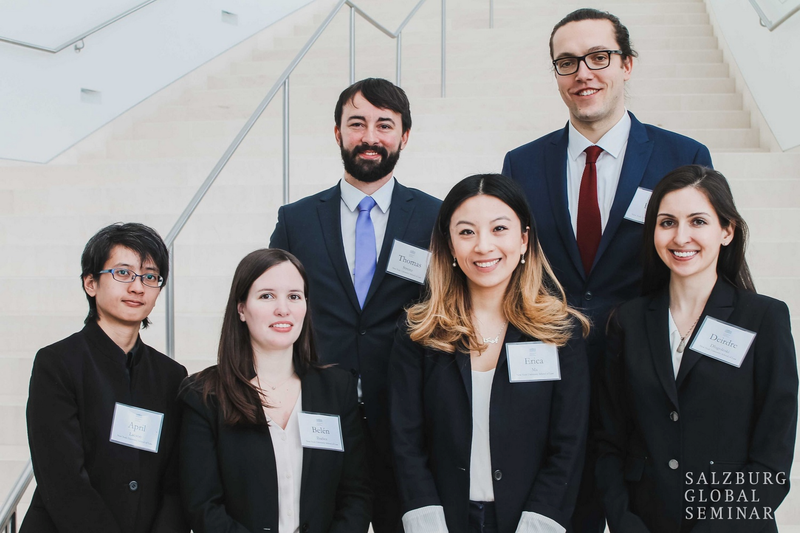 In February 2019, students Deirdre Dlugoleski, Belén Ibañez, April Lacson, Felix Boos, and Erica Ma represented NYU School of Law at the Salzburg Cutler Fellows Program, held annually in Washington DC. Adjunct Professor Thomas Streinz (Executive Director, Guarini Global Law & Tech; Fellow, IILJ) accompanied them as NYU’s faculty representative. The Salzburg Cutler Fellows Program is a one-of-a-kind program for students who intend to pursue careers in international law, legal practice, and public service. Each year 55 law student Fellows are selected in partnership with 11 top US law schools. The Fellows are 2L, 3L, and LLM degree candidates focused on international law, and hail from countries around the world. Each Fellow prepares and presents a research paper on a topic of private or public international law. Some of the top law faculty in the US offer advice on how to make their argument more effective and how to succeed in getting papers accepted by journals in across the world. In parallel, lawyers and other mentors in public service help Fellows explore traditional and non-traditional pathways to careers in international law and public service that can align passion and personal impact. The Program identifies and empowers outstanding talents, fosters leadership skills, and builds lasting collaborative networks within the legal and public service sectors. NYU School of Law has sent students to the Salzburg Cutler Fellows Program since 2013.